Woohoo! 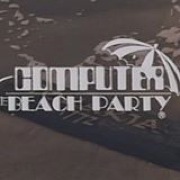 It's a computer beach party! Actually the movie is just as stupid and nonsensical as it sounds but that's all part of the fun and charm of it really. I just can't hate on movies that don't take themselves serious at all. Sure, it's a badly done film, with a silly and almost nonexistent script but it doesn't ever pretend to be more than it is and luckily it knows how to be fun to watch as well. Watching this movie really isn't that bad of an experience. As you would imagine, this movie has a pretty simple and straightforward story. It basically features a 'save the rec center' type of plot, or as in this case; a save the beach type of plot! Not that there is much of a villain or threat in this movie but hey, at least the movie is trying to feature somewhat of a conflict in it. So when or how does the computer come into, you may be wondering? Well, it's not like it ever truly becomes a big or important part of the movie its story and the way it gets used is quite silly really. Every now and then it gets used to look up some very random stuff and the main character uses it to impress his new girlfriend with but other than that, they might as well have left it out entirely. It's as if the writer of this movie had bought a new computer and was marveled by all of its possibilities, which at the time were still very limited of course and decided to base a movie around it, or incorporate it into an already existing script, only to find out later that there wasn't really all that much they could do with its concept and decided to make it more of a surfer's movie instead. Well, not that the characters are any real surfers but there is definitely a surfer type of mentality over this movie, which is of course due to its settings and the way all of the characters act in this. They are all about partying and having a great time and seem to worry about little else. Luckily it isn't ever anything annoying to watch and it's quite entertaining actually. The characters are all likable enough, even the ones you are supposed to hate. It's all very over-the-top, not just it's story but also all of its characters. Some of them are just plain goofy ones but I have to admit, it works out well for the movie and its comedy. It's also really filled with some absolutely random moments, that all add to the fun as well, such as a subplot involving a giant chicken car. It really still remains a cheaply and poorly done movie as well though. The editing, camera-work, dubbing, acting is all quite terrible, so I can understand people not liking this movie. I however can't deny that I had a good and fun time with it, no matter how bad and silly it all got at times.